Michael Yurchak (Meisner Technique, Technique Series, Voice for the Actor) is an award winning actor, voice over artist and educator. He has taught voice over and acting workshops around the country to all levels of students. In addition to his work with EMAS, Michael works as a Lead Teaching Artist for Shakespeare Center LA, Pasadena Playhouse, Center Theater Group, and Will Geer’s Theatricum Botanicum. 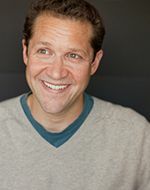 He holds a BA from Colgate University and an MA from NYU and is a Certified Associate Teacher of Fitzmaurice Voicework. Michael has appeared in multiple films (and television programs including Modern Family, Franklin and Bash, Mad Men, It’s Always Sunny in Philadelphia. He also has extensive stage credits in both LA and New York, including Death of A Salesman, Hamlet, King Lear, Macbeth, Romeo & Juliet, Julius Caesar, and A Midsummer Night’s Dream. As a voice artist, Michael currently plays recurring roles on the hit animated shows The Legend of Korra (Nickelodeon) and Naruto (Disney XD). He has voiced dozens of commercials and video games a New York News Emmy Award for his promo work on NY1 for which he also received the Silver Promax Award two years in a row.